The name Ternopil, according to one tale, originates from the phrase “ternovoye polye” (literally, “blackthorn field”), because of blackthorn trees that used to grow here. Another legend claims that the city was named after its founder, Grand Crown Hetman Jan Tarnowski. Ternopil stood at the intersection of important trade routes in middle ages. The city was a part of the Austro-Hungarian Empire since the late 18th century, but after the end of the World War I, it returned to Poland. In 1939, Ternopil became a part of the Soviet Union, and, since 1991, of independent Ukraine. VNPZ European University Ternopil branch – office in Ternopil was established in May 2001 . Forms of study: full-time, part-time, distance, postgraduate education. It trains specialists in: business economics , information management systems and technology , management organizations ( tourism , health care , industrial area , trade and services , transport ). Director – A. Zaika  . The decoration is Ternopil Theatre Square and Shevchenko Boulevard. In April 29,1990 for the first time in the country the Ukrainian national flag was raised and consecrated. Prior to this, the Chamber held the Regional Council of People’s Movement, the first in Ukraine on March 24, 1989. In the city square gatherings and meetings were held by democratic parties and social organizations, there urochyny graduates. They brought flowers to the monument to Taras Shevchenko, set in a park near the square. Outside Hetman Sagaydachnogo in May 28, 1995 a monument called I. Frank was consecrated, which naturally fit into the architectural ensemble of the city. This gives more proof that Ternopil continues with its cultural and artistic traditions. Since the last century to the present day, Ternopil celebrates the anniversary of Taras Shevchenko every year. Memorable events in the life of the city were giants Ukrainian theater performances M. Kropivnitskogo , M. Zankovetska , M. Sadowski, composer M. Lysenko, the world famous Salome Krushel’nyts’koi. During the First World War director Kurbas organized the famous “Ternopil Theater Nights”. Theatrical life in Ternopil generally related to the existence of XVIII – early XIX centuries in ancient palaces and castles landlords, graphs so-called “mayetkovyh theaters” with equipped rooms, stage, presence of a small orchestra, a choir of talented and educated peasants corvee conductor. These “estates theaters” were in the Golden Flow and Vyshnivtsi . Palace in Vyshnivtsi, where he was “mayetkovyy theater” surviving. In March 29, 1864 a professional theater company called “Conversation” began its first activities win Ukraine. It showed dozens of performances in Lviv, Przemysl, Coloma, Stanislav, Sambor and Chernivtsi and after 15th months of its existence in June 10th 1865 it came to Ternopil. In the streets of Ternopil they hung theatrical posters signed by director Alexander Bachinskiy. They were proclaiming: “Association of Ukrainian folk theater from the city put in Ternopil 20 dramatic works.” Correspondent Lviv newspaper “Slovo” on this occasion reported that Ternopil with great joy was awaiting them as they had not before seen another Galician tail of professional artists.The play opened in Lviv Theatre and was well received by all who saw it. This marked the first statement of professional theater in Ternopil. The performance made a strong impression on the audience, all admired the talented artists in December who included natural T. Bachynska as Natasha and G. Molentskoho as Makogonenko. The hall was crowded with commoners and intellectuals alike. There were peasants from nearby villages. In other roles were: B. – Terpelyha, Witoszynskyj – Peter, Stephen – Nikolai Ermakov – Voznyy. The climate is moderate continental type, with warm humid summers and mild winters. Average temperature varies from 5 degrees Celsius below zero in January to 19 degrees C above zero in July. Ternopil region is an Agro-industrial area. Its location in the western part of the right-bank forest-steppe zone of fertile soil and sufficient moisture promotes agricultural production, and the location near the Lviv-Volyn coal and industrial Carpathians promotes the development of various types of industrial production. Business: The area with high population density causes the prevailing labor-intensive industries.The most important industries areas include: food; engineering and metalworking; light industry; construction materials industry; milk cereal products and woodwork industries. There is a large food production industry in the region. The main industries are: sugar, meat, dairy, alcoholic beverages, confectionery, tobacco, fruits, vegetables, milk and other industries. The volume of production and sales is the leading sugar industry (in the region has nine sugar factories), which along with alcohol and plodoovoschekonservnoy is a branch of specialization,Ternopil region. in national and regional division of labour. The transport network in the region is well developed to the national standards. The main means of transport are road and rail. Road transport carries more than half of all traffic (an average of 35.5 million passengers and 1.1 million tons of cargo per year). The length of regional roads is about 5,100 km and 5,000 km of this is made up of paved roads. On average, 1,000 Km2 area has 370 km of roads, including 362 km paved roads. The regional railway is 575 km long and the density of railway network is 41.4 km per 1,000 Km2, which is much higher than in the whole of Ukraine (37.6). Railway transport on average carries 0.7 million tons of cargo and 8 million passengers every year. Industry | the T. region has a significant number of companies that are promising and quite attractive targets for investment. Due to lack of sufficient investment resources in Ukraine, the area is deeply interested in attracting foreign investment. There is currently a great need in the implementation of new technologies, modern management, debugging and development of infrastructure, application knowledge and experience of the market economy. Orientation in policy, law, business country, understanding the socio-cultural traditions, major ideas and the mentality of its people are the key success factors, particularly in developing new markets. The main types of industrial products shipped for export include: chinaware (faience), glass, lighting fixtures, cotton, shoes, radio systems type “Transport”, “Orion”; decimeter satellite antennas; beet; furniture, veneer, flooring; Artificial leather; household chemicals, detergents, shampoos. Agriculture | T. region. is a developed agricultural and industrial region of Ukraine. Significant natural and human resources, the concentration of manufacturing industries (sugar, alcohol, ) geographical location at the crossroads of major transport roads of Eastern Europe to Central and Western Europe have helped to make the region as an area with good opportunities for business. Level osvoyennosti land resources is high enough. Of the total area of the land fund (1382,4 thousand. hectares) make up 85% of the land used for farming agriculture. Most of these lands have agricultural land, whose area is about 1000 hectares. Plow territory is 64%. Arable land in the structure of agricultural land is 84.2% (about 890 thousand. Hectares). This is one of the highest in Ukraine. Major agricultural products Ternopil supplied for export: butter, cheese; Technical casein; milk powder; Meat and offal category I; sausages; sugar; canned vegetables; canned meat; confectionery; mineral water; food concentrates; alcoholic beverages; Food alcohol; pasta; grains (barley, oats, buckwheat, grapes); potatoes, vegetables; flour, groats. T. region. is a leader in Ukraine work piece on non-timber products, ie fruits, berries, birch sap, doctoral herbs. Forest areas have significant resources doctoral material. Covering an area of over 860 hectares of plantations established wild rose, viburnum, buckthorn, chokeberry, dogwood, magnolia Chinese. Great importance doctoral grasses: St. John’s wort, strawberry, mother-and-stepmother, celandine and others. Although most of Ternopil is new, the city has 16th century Nativity and the 18th century Dominican churches. The city is well known for its architectural and cultural monuments. It is very comfortable for foreign travelers. There are a lot of exchange points and modern hotels. 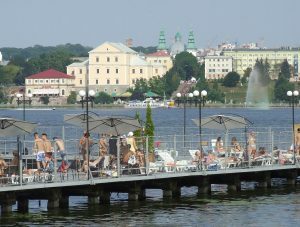 Ternopil is in the center of a region made famous by its castles, waterfalls, caverns and rivers. It is the start of picturesque rafting routes along the Dniester canyon, tours to Ternopil caverns to the highest lowland Dzhurinsky waterfall and an ancient church in the rock in Monastirka on the river Strypa. Traces of ancient people sites are found in the nearest settlements which are Veliky Glybochok, Petrikiv and Stupky. In spite of destructive wars which the town faced several times, several houses – monuments of architecture, history and culture are still preserved in the city. They are marked by features of eclecticism and modern styles – fashionable at that time. Architectural ensembles in the central part of the city give an idea of old Ternopil architecture. Ternopil has all means of transport ( buses , taxis, shuttles), electric ( trolley ), Railway (train, diesel trains), air ( planes , helicopters ) and water transport ( boats , yacht , sailboat ). The First Ternopil trolley line was made 25 December 1975 year. By 2003 , in the city there were 15 trolleybus routes. As of September 2012 in Ternopil has 9 trolleybus routes (including second “peak”). Ternopil serve an average of 50 trolleybuses. The city used trolley manufacturers such as Škoda , JUMZ and LAZ . The current bus station in Ternopil opened in 1971 year. It belongs to the I class. It offers passengers – mother and baby room, post office, hairdresser, cafe, pharmacy and newsagent, ticket office, information desk, phones, camera storage. Ternopil is an important railway junction. From Ternopil run trains in the following key areas: Lviv , Khmelnytsky , Chertkov , Lanivtsi , Rohatyn . Ternopil station was founded in 1870 with the way it was laid railway line Lviv-Podvolochisk. Since that time the building underwent several reconstructions. Now within Ternopil has one passenger railway station is the main station of Ternopil, located in the area between the streets of Bohdan Khmelnytsky , Veterans Division “Galicia” , Salome Krushel’nyts’koi . In warm weather, the vessel connecting downtown to Long Beach, and the cooler days do cruises without stopping. Ticket price for the full range as of 2012 year is 5 USD, one way (to the restaurant “Farm” or to Far Beach) – 2 USD. Tickets for children aged 5 to 10 years – 50% of the total cost. Children under 5 years of age travel free. In addition to ships on the lake you can see the boat tail number TS-88-K. She is moored at the pier, in the park. Shevchenko , opposite the playground. It can also be ordered for a walk. Rental price for half an hour is 90 USD. Also on the lake is life hydroplane hovercraft – MARS-700, which belongs to the regional emergency department. The new runway was commissioned Ternopil Airport. It has the status of “international”. Takes only charter flights. Several years ago, twice a week were flying to Istanbul ( Turkey ), and in 2010 was a long time operated a special flight “Ternopil, Kyiv”, which subsequently canceled due to unprofitability. The plans of local and regional authorities – have Regular flights.